LOCATION: Turtle Creek Golf Estate is a stunning eco & lifestyle golf estate development on the Goose Valley Golf Course in Plettenberg Bay. Situated on the N2, only 2km outside Plettenberg Bay in the direction of Port Elizabeth and bordering on the Keurbooms Lagoon. The eastern side of the estate borders on the Keurbooms Estuary which offers excellent and safe swimming, boating and fishing facilities. The Western side has access via the N2 national highway to Knysna, George & Cape Town. VIEW: Situated in pristine surroundings overlooking the magnificent Gary Player designed 72 par, 18 hole golf course, surrounded by indigenous Fynbos which is home to small buck, tortoises and spectacular bird life. Up market, spacious comptemporary-modern double storey house in secure residential estate. Ground level houses the living area with open-plan lounge (with fire place), informal seating area, dining room and kitchen. 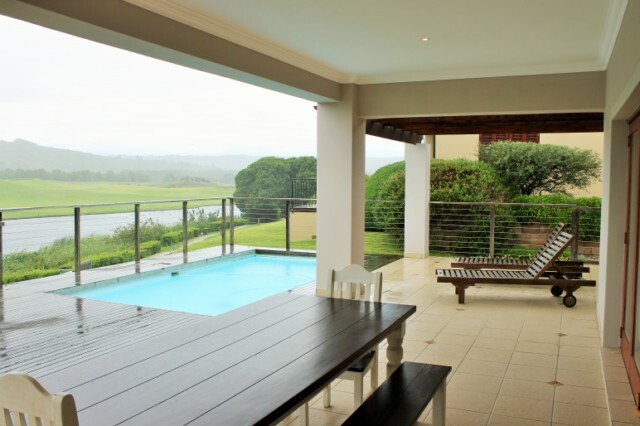 Living area opens out onto cover verandah with pool and built-in braai, overlooking manicured golf course and pond. Scullery off kitchen inter-leading into double garage. Guest toilet. Bedrooms 1 & 2 downstairs and 3 &4 on the upper level. BEDROOM 2: Queen en suite (bath/shower/toilet), opening onto covered pool deck. BEDROOM 3: Queen en suite (bath/shower/toilet), opening onto uncovered deck with views. BEDROOM 4: 2 x ¾ beds en suite (bath/shower/toilet), opening onto uncovered deck with views. - Swimming pool, not fenced and no cover/net.